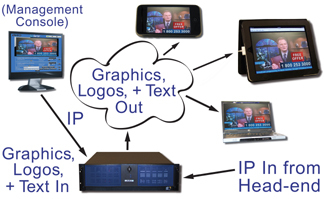 Adding graphics or logos directly to MPEG transport streams can be complicated for TV service providers. Laslo Zolton, Vice President of DVEO explained to me at the TelcoTV trade show that broadcasters want to insert graphic logos and other media into broadcast transport streams. This typically requires decoding and modifying the transport streams which requires costly equipment and can be complicated, especially to provide many local graphic insertions. The solution is to use a server that can directly insert the graphics and media directly into transport streams. The DVEO Ad Serter system can automatically insert graphics and text into real time IP, ASI, or SDI single or multiple program transport streams - MPTS. This includes original slates, crawls using Unicode language commands. This is a great solution to provide SuperPosition ads on mobile apps, EAS alerting messages, or news feeds for the bottom of the screen.